Daybreak was hours away and the state remained paralyzed by the post-Christmas blizzard of 2010 when Jessica Furlani left home for her 12-hour shift at Monmouth Medical Center in Long Branch. For a labor and delivery nurse, there are no snow days, only babies to deliver. She only made it half of the way to work before she found herself among a half-dozen other motorists who got stranded in mountainous snow drifts along an unplowed section of Route 18 in Tinton Falls. It was 5 a.m. Dec. 27. Hours passed. Cars ran out of gas and motorists doubled up in cars. By the 12-hour mark, Furlani had given out most of her food and water. By 23 hours, Furlani and two people who had migrated to her car were desperate. "Out of nowhere, we see these guys in Army uniforms coming to rescue us. It was amazing," Furlani recalled. "I'm not sure what would have happened if they hadn't gotten there soon." 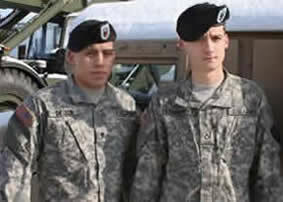 The guys in uniforms turned out to be New Jersey Army National Guard Soldiers -- Spc. Andy DeLeon and Pfc. Brian Francione. The 50th Infantry Brigade Combat Team Soldiers had volunteered for snow duty and spent several uneventful hours in Hamilton before getting in a Humvee to respond to reports of stranded motorists. "When we got out there, it was crazy. The snow was waist high even in the road and there were cars everywhere," said Francione, a combat engineer assigned to Alpha Company of the 50th Special Troops Battalion. "Some had been out there for a day … the nurse, an EMT, even a plow driver." The Soldiers transported Furlani and the two other people waiting in her car to the Tinton Falls police station and then returned for two other people. "It was amazing how all these people kept going that long. I'm sure that was something they didn't expect," said DeLeon said. DeLeon, a Signal specialist assigned to the Brigade Headquarters Company, said his duty during the storm was the most gratifying he's had in his two years in uniform. "It was an experience I won't forget. I'm glad I went ahead and took the duty," he said. "It was a good feeling to help people. You could see the joy on people's faces when we got to them." Senior Master Sgt. Freddie D. Lavan Sr., center, 177th Fighter Wing Traffic Manager, shakes hands with Norman Baker, left, while Thomas Sholders, right watches. Airmen from the 177th Fighter Wing and the 108th Wing were joined by fourth graders from the Seaview School in Linwood and the St. Augustine School Choir for the 10th Annual Holiday "Songfest" at the Vineland Veterans Memorial Home on Dec. 15, 2010. 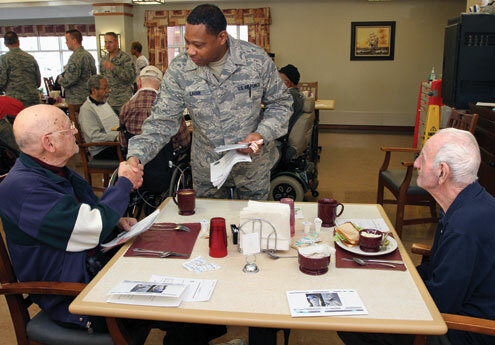 Upon arrival, Airmen and students were issued candy canes and holiday greeting cards, assigned to groups and sent out to spread cheer to the residents. Congregating in cafeterias, day rooms, as well as serenading individuals in their rooms (those residents that are bedridden), the carolers passed out cards and candy canes, sang and chatted with the residents. U.S. Air Force photo by Master Sgt. Mark C. Olsen, 177FW/PA.